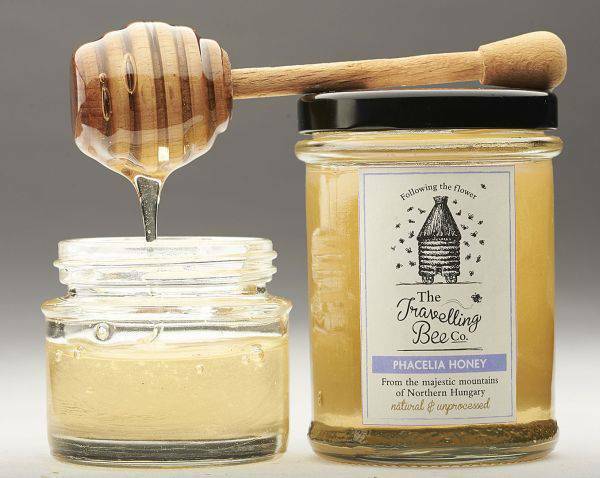 Phacelia honey – good for our health and yummy for the bees! Phacelia tanacetifolia is simply a weed – people would say! What kind of honey can come out from a weed? Some even say this honey has no health benefits. At all. We dare to say they are wrong. In Europe beekeepers know this plant very well. They brought it here and even made entire crops, because in some years, like it was in this 2016, due to unfavorable weather conditions, acacia had a very poor production. And they managed to save the spring honey production with phacelia. Other names: Lacy or Tancy phacelia, Blue tansy or Purple tansy, Fiddleneck and Valley Velvenia. Origin: Drylands of California, chaparral and Central oak woodland. Today is being increasingly used in California, especially in vineyards. Naturalized in: Western US and Europe and now extensively used as nectar crop in Australia. – it is comparable to buckwheat (see Buckwheat honey) in many ways. Cultural differences are that buckwheat germinates more readily, especially at higher soil temperatures, and phacelia is more tolerant of cold and drought. – it may be suitable as a winter-killed cover crop when a heavy crop residue is not needed in the spring. 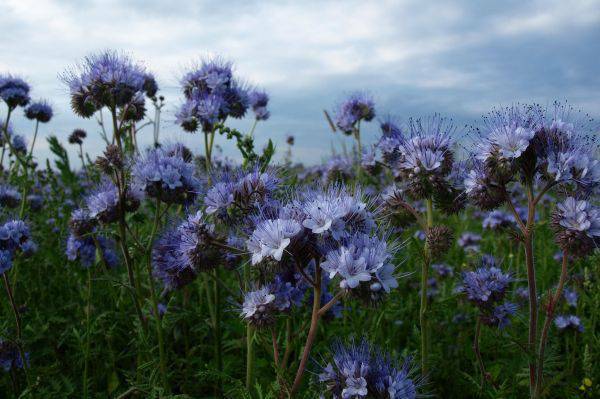 Why is phacelia so good for honey crops and bees? · It has a great habit of flowering abundantly and for a long period. This increases beneficial insect numbers and diversity. It’s highly attractive to honey bees, bumblebees, and syrphid flies, and these insects are valuable pollinators. But it also attracts other beneficial insects, such as parasitic wasps and minute pirate bugs. · It provides high quantities of nectar, being the second plant after the acacia which gives most nectar. A single flower can give up to 4.5 mg of nectar, with a sugar concentration of 28% (Cirnu 1973). 10,000 m² can produce between 300 and 1000 kg of phacelia honey. · It is a sweet and complete flower for the honey bees because it provides both pollen (for protein – needed for egg production) and nectar (for carbohydrates – needed for energy). For humans it is highly important as it provides us with honey in times when other flowers cannot resist the bad weather conditions. “Last year, I planted a wildflower mix that included purple tansy. It was covered with bees. And, it survived the worst drought in Texas’ recorded history and bloomed for almost 3 months without water, and in our ungodly hot summer! Because phacelia is a very common plant in North America, it is considered to be Winnie the Pooh’s favorite honey! Here is one of the best phacelia honey, from the majestic mountains of Northern Hungary. To combat the idea that phacelia honey has no health benefits, we have to remember that it is honey, first of all. Which means it is made by bees, with added enzymes. Any nectar coming from any flower, combined with bees’ enzymes turns into valuable honey for our health. Secondly, the nectar of the plant is valuable because the plant is used a lot as essence, alone or in combination. – can be used by people lacking in confidence, for people who feel that they need to constantly seek the approval of others. – it offers emotional support when a person is easily exploited. – it can be helpful for the left eye, ear and nose, additionally left sided headaches and sinusitis. – it is valuable for the treatment of the virus Condyloma (warts) and for herpes simplex (cold sores). 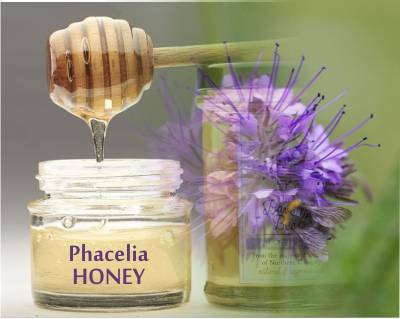 • Like any other type of honey, of whatever the plant, the phacelia honey has disinfectant and skin care effect, also helping in treating burns. • It significantly maintains the blood cholesterol level. • has an estrogenic action, helping in fixing calcium in the bones, while in women favors the emphasizing of feminine features and has strong rejuvenating effect. – facilitates the digestion of proteins and fats. Honeycave.eu, a Hungarian site, sells it online with €4.24 for a jar of 250 g of honey. Or cheaper here at Eifelbienen.de: 500 g at €4.49. Why is phacelia pollen purple? Generally the pollen is bright yellow. But oftentimes it can be from white to orange, and green to brown and red, even bright blue, fuchsia, and in this case, purple. Scientists say that the traditional yellow pollen comes from flavonoids, the chemicals found in abundance in citrus. There hasn’t been researched on what makes phacelia pollen purple, but according to Lila Higgins on nhm.org, responsible for this can be another colorful compound, anthocyanin which is also present in blueberries and raspberries. According to a study Introducing plants for bee-keeping at any cost? — Assessment of Phacelia tanacetifolia as nectar source plant under xeric Mediterranean conditions, by P. Petanidou from the University of Aegean, Greece, published in 2003, these flowers behave differently in Mediterranean conditions. Be careful to the specific time in the year, when you plant phacelia. Their time of blooming should not coincide with the other time of blooming of the plants you want your bees go to. If these flowers bloom in the same time, for example acacia and phacelia, bees will chose phacelia over acacia, as is is more attractive to them. picture of Phacelia flower used in the featured image – credit LincolnGreen via flickr.com published under CC. Had seen this bee pollen with lots of blue colour on sale recently. Do beekeepers spray colour on them? How do we know it is the real thing since it is rare. You really should not worry about the colored grains of pollen. Pollen changes color according to the flower is was harvested from. And even if they say the pollen is from a single specific flower, bees are not that selective and stop on other attractive flowers as well. See in this article the picture with the pollen, or in the picture about beebread, how many colors the pollen has in the comb cells, here. it’s very suggestive. Purple grains of pollen are quite often here in Europe, it is found almost in any type of monofloral bee pollen available on the market.